22nd September 1791, Newington Butts, now part of Southwark, England. Michael Faraday was the son of a journeyman Blacksmith and a member of the Glassite Christian sect. Teachings by members of the Sandemanian Sect. 1805: Faraday became apprenticed to a local bookseller and bookbinder where he developed an interest in science after having read many of the books on display. 1812: He attended lectures at the Royal Institution given by Humphry Davy. Faraday sent Davy his notebook from the lectures which ran to over three hundred pages which impressed Davy immensely. 1813: Faraday was appointed as a Chemical Assistant at the Royal Institution which in effect meant he was Davy’s assistant even though Davy had turned him down for that job. Faraday invented the Bunsen burner in the course of this work. In October Faraday accompanied Davy and his wife to Paris. They received a special pass from Napoleon Bonaparte to make journeys in France to study vulcanism. Faraday initially went officially as Davy’s valet as his normal valet refused to go. His wife Jane Apreece always treated him like a servant and made him travel on the outside of the coach and eat with the other servants. 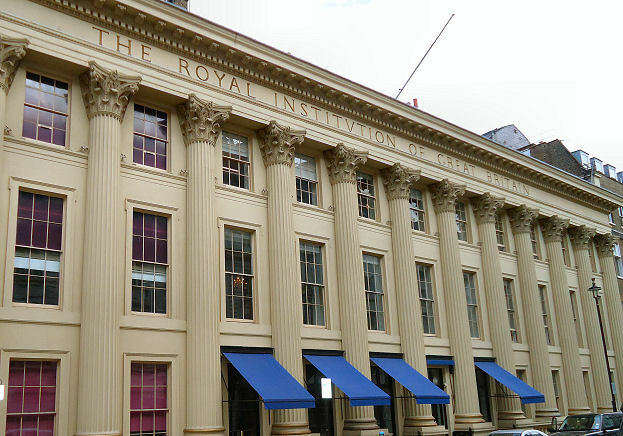 1815: He returned to England and continued assisting on experiments at the Royal Institution. 1821: Faraday invents to first electric motor after first working on the principle of the dynamo which had a conductor wound around a magnetic field. 1824: Faraday is elected a Member of the Royal Society. 1825: He is appointed Director of the laboratory at the Royal Society. 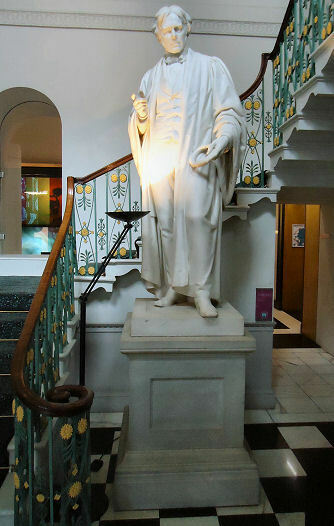 1826: Faraday started the Royal Institution’s Friday Evening Discourses and the Christmas Lectures. 1831: He began a series of experiments which led to the discovery of electromagnetic induction and the induction ring. He observed that a moving magnet induces an electric current in a coiled wire. This led him to develop the transformer. He was to be the first to use terms such as electrode. 1832: Faraday worked on the effects of static electricity and stated the laws of Electrolysis. He used the word Ion for the particles he believed which actually carried the electric current. He was granted an honary Doctorate by Oxford University. 1833: Appointed Fullerian Professor of Chemistry. 1836: Appointed Scientific Adviser to Trinity House. 1839: He continued his work on Electrolysis and magnetism and proposed that only a single type of electricity existed but that different amounts of voltage would induce different effects. 1845: Faraday observed that light propagation could be influenced by external magnetic fields. 1848: Albert, The Prince Consort lobbied to allow Faraday a grace and favour house in Hampton Court, free from all expenses. He was given the Master Mason’s House, later renamed Faraday House, at Number 37 Hampton Court Road. 1850: Despite much experimenting he failed in his attempts to find a link between gravity and electromagnetism. 1851: He worked on the planning for the Great Exhibition. 1853: Faraday refused to assist the Government on designing chemical weapons for use in the Crimean War due to ethical reasons. 1855: He wrote a letter to the Times Newspaper about the foul conditions of the River Thames which became satirised in Punch Magazine. 1858: Faraday retired to live in Faraday House, Hampton Court. 1862: Gave evidence to the Public Schools Commission on education in Great Britain. He spent the latter years of his life studying light and spectral change. 12 June 1821 to Sarah Barnard. 25th August 1867, Hampton Court, Near London, England. Highgate “Old” Cemetery, London, England. Memorial Plaque in Westminster Abbey near the grave of Sir Isaac Newton. There is a statue of Faraday at Savoy Place, outside the Institution of Engineering and Technology.